For people who have intermediate to advanced touring experience and moderate to advanced riding skills, a ride down Mt. Baker will be a ride you'll never forget! Thousands of alpinists slog up and down the mountain year after year but the enjoyment of linking turns and slashing your way down 6000 - 7000 feet or more will have you thinking twice about ever walking down a mountain again. Ski/splitboard mountaineering is the next step if you're comfortable on your touring set-up and you're looking to get into bigger objectives in the mountains. The Mt. 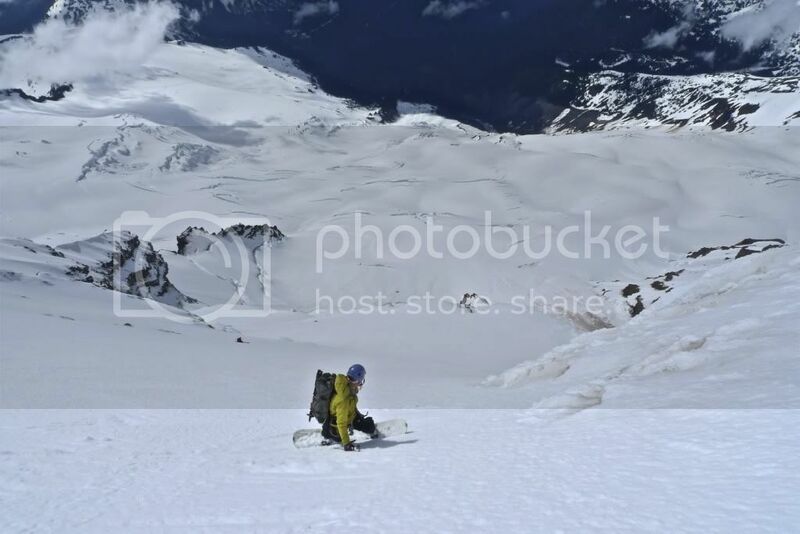 Baker summit and ski/snowboard course is an unforgettable trip that will change the way you think about mountaineering. 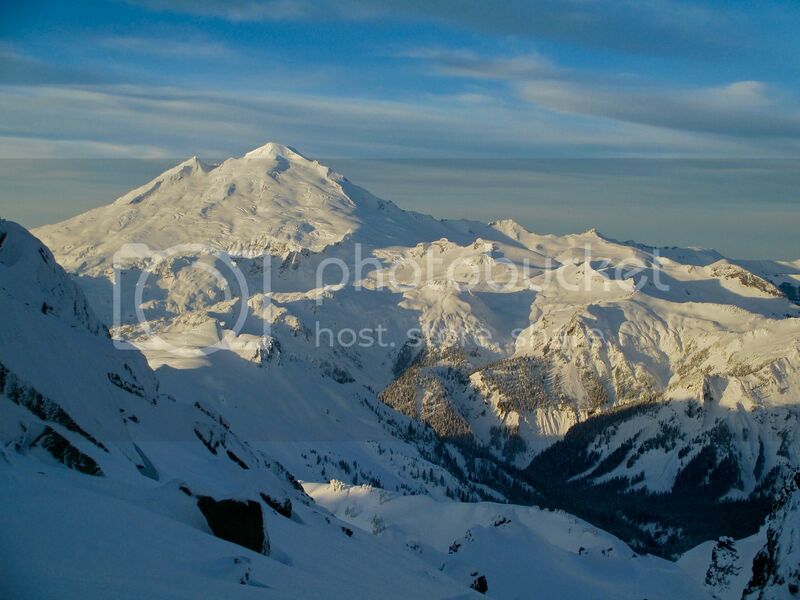 Mt Baker is one of the most beautiful mountains to ski or snowboard. There are many variables in skiing or snowboarding on a complex mountain such as Mt. Baker. We will be climbing and skiing one of Mt. Bakers most popular and beautiful routes, the Coleman-Deming. Its popularity stems from the panoramic alpine views and the sight of the San Juans Islands and Washington's inland waters far below. This is a shorter, three-day trip because of the simplicity that skiing or splitboarding brings to mountaineering. When you have a touring set-up, it's typically more expedient on the ascent and decent which minimizes a lot of time and suffering that typically goes into climbing big mountains. 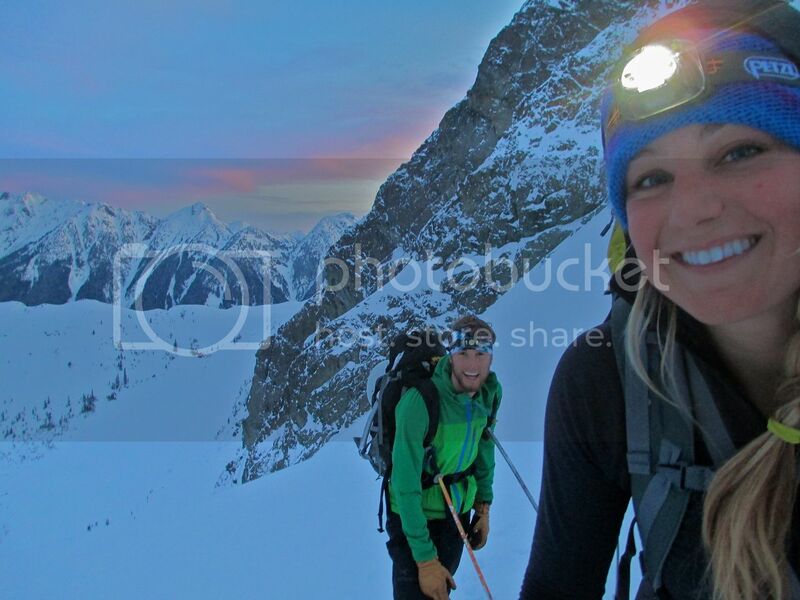 We'll cover ice axe and ski/splitboard cramponing techniques and roping up for glacier travel. We'll go over skills of route finding, terrain selection, effective decision making and the evaluation of subjective and objective danger. For climbers who have previous glacier touring experience, we will use the second day to advance your skills in glacier touring, skinning and self-rescue. The last day we will get to put all of our skills to use as we summit the 10,778 ft peak and get the extraordinary experience to ride or ski all the way back down to camp, pack up and continue the descent. This trip will leave you with exceptional memories, additional skills and confidence to pursue ski/splitboard mountaineering on your own or on another guided trip! Day 1: Meet at AAI at 7am. Go over rentals and trip logistics. Get to Heliotrope trailhead at 3,336 feet, we will make sure everyone is comfortable with their touring set-up and start our skin up to our base camp at camp Hogsback camp or another camp. That evening we set up camp, go over knots, self rescue and basic winter camping etiquette. Day 2: Our second day we will advance our knowledge of backcountry touring and skiing/snowboarding etiquette. We'll go over skills of route finding, terrain selection for ascending and descending and the evaluation of subjective and objective danger. If conditions are fit, we will practice using our beacons, shovels and probes and asses the terrain for avalanche dangers. We will practice touring on all kinds of terrain and go over glacier travel and roping up while touring. Day 3: Summit day we will leave camp depending on conditions at a relatively early hour. We will use our skills of hazard evaluation and efficient touring competence to navigate through a vast terrain of glaciers and GNAR and make it to the summit! We will ride or ski back down to camp, pack up our things and ride the rest of the way down, completing an amazing climb and ride! Something you'll never forget! AIARE Rec 1 and AIARE Avalanche Rescue Courses highly recommended. Inclusions: Included in the course cost is group technical climbing equipment (personal climbing equipment is available for rent at a nominal charge), transportation to the climbing areas from AAI headquarters, all permits and camping fees, and the guide fee. Exclusions: Not included in the course cost is all personal clothing and climbing gear (crampons, ice axe, harness, helmet, tent, etc), gratuities to guide, meals while on the course, or travel insurance.